The second thing I'd like to do to my lock screen is to be able to add more than 1 widget. I've seen pictures of people having 3 different widgets on their lock screen, but I'm just able to add 1 per screen. I'm adding a picture for this too. I have more customization questions but I'm just gonna bother you guys with these 2 for now... I like to figure out these thing on my own but this time i was not able to. The app widget locker should do what you want done. Not sure if you've tried that or not. For the first image, its not 3 different widgets on a single lockscreen, you can only have 1 widget per page, but you can have multiple pages. To enable this, go to Settings -> Security -> check "Enable widgets". Then go to your lockscreen. Swipe down from the clock, it will expand, tap and hold on it, it will let you drag the clock to the trashcan, then you can add a new widget. While the widget is expanded, you can also swipe right to go to a new page to add more widgets. As for the second image, it's generally referred to as the lock ring. The app "WidgetLocker" can give you this feature. Otherwise, you need to install a custom rom such as CyanogenMod or AOKP. UJ95x and papelet like this. I haven't but I'll give it a try. Thanks! I am baffled by what you are complaining about. You seem to not know how to put widgets on your home screen. I have several, and even folders with more widgets on the main home screen. In fact, it came that way, and I have added more. 1. Go to the Home screen where you want to place the app. 2. Touch the All Apps icon. 3. Swipe from right to left, if necessary, to find the app you want. into place, and lift your finger. 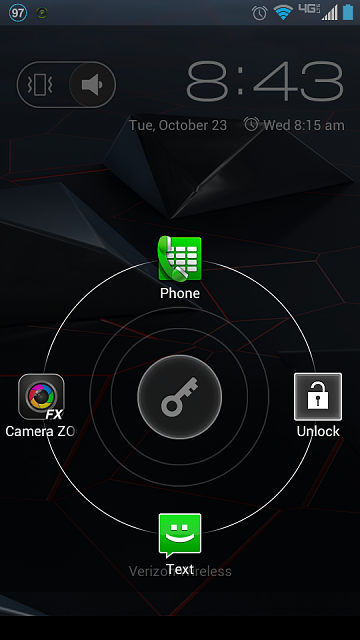 On Nexus 5, touch & hold the background of any home screen to reveal the widgets control. Touch & hold the icon. Slide your finger to the new position. To move between Home screens, slide toward the edge of the screen. To bump another icon out of the way, slide slowly into it. For creating folders, push one widget over another and let go. Then open the folder it creates and rename it. You have no idea of what I'm talking about. No way to purchase music?